‘Barbaric,’ ‘insane,’ ‘gruesome’ and ‘cowardly’ – these are some of the words that have been used to describe the attack that took place at the Nyanya motor park on the outskirts of Abuja on Monday, 14 April. It is believed that the attack was carried out by a suicide bomber who filled his car with explosives before driving it to the motor park, where hundreds of commuters gathered to board buses during the morning rush hour. According to the latest estimates, the attack killed about 200 people and injured many more. The notorious Islamist militant group, Boko Haram – which seeks to rid Nigeria of Western-style education and to install an Islamic state based on Sharia – claimed responsibility for the incident. 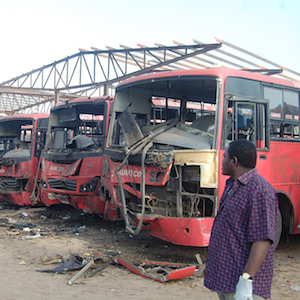 As with the group’s previous attacks in and around Abuja, the Nyanya incident is aimed at undermining the government of President Goodluck Jonathan, and intended to debunk speculations that Boko Haram has been confined to its bases in the northeast of the country, and that it is dwindling towards its end. The timing, magnitude and targets of these attacks are intended to cause maximum destruction – and also to incite anger against Jonathan as the nation gears up for elections that are already deeply mired in political controversy. As Nigerians ponder over the horror of the attack, the key question is how Boko Haram has continued to elude Nigeria’s counter-terrorism machinery. Boko Haram has become the greatest threat to Jonathan’s government, and the single most destructive group in the country’s history since the Maitatsine movement in the 1990s. The first factor of Boko Haram’s success is the relative lack of knowledge and information about the group. Very few, if any, comprehensive and empirical studies have been done about Boko Haram, and scanty intelligence reports have not been able to fully connect the dots. Terrorist groups that have been subjected to elaborate empirical studies – such as the Lord’s Resistance Army (LRA) in Uganda and al-Qaeda in the Maghreb (AQIM) in Algeria – have been significantly weakened or isolated. Boko Haram, however, has created a mystical aura that perpetuates a sense of invincibility and fear, which has generated various superstitious beliefs about the sect. For example, in most communities in northern Nigeria, people believe that members of the group are present everywhere, and could even be the person closest to you. The second factor is the politicisation of terrorism and counter-terrorism in Nigeria. Despite the horror that Boko Haram has caused, Nigerians remain tensely divided about the group. On the one hand, Boko Haram is seen as a creation of the main opposition party, the All Progressive Congress (APC) led by a northerner, Muhammadu Buhari – a retired major-general and former military leader. Some northern elites have also been accused of sponsoring the Islamic sect. On the other hand, counter-terrorism actions directed at Boko Haram in various northern cities have been criticised as attacks on Muslims. As the 2015 elections draw closer, the rift between the opposition and the ruling People’s Democratic Party (PDP) is currently at its widest, and terrorism will become even more of a key issue. The lesson is clear: the greater the fragmentation or lack of unity in a country, the greater the risk of terrorism. Boko Haram already exploited this divide in the previous election, when the group carried out almost daily attacks that resulted in over 1 500 deaths. The Nyanya attack has therefore sent a chilling signal that the 2015 elections could see even more attacks, particularly given the current tense political atmosphere, which has seen a record number of politicians switch loyalty and parliamentarians change parties. The third factor relates to the excessive use of military force, which provides only short-term solutions with the risk of triggering unintended consequences. The government wants to eliminate Boko Haram by destroying everyone associated with the group: the same approach that was used to eliminate the Maitatsine movement – which never truly disappeared, but transformed or re-emerged in groups such as Boko Haram. This predominant military response also contributes to the politicisation of counter-terrorism, as collateral damage from military operations is seen by some as a ‘genocidal campaign’ against the north. Others have accused the federal government of being behind the Boko Haram killings. These accusations and counter-accusations by politicians significantly undermine counter-terrorism efforts in Nigeria. Boko Haram thrives today as a toxic mix of politics, ethnicity and religion. It frequently targets some of the most vulnerable and defenceless communities – including schools, markets, bars and places of worship to maximise casualties. In the days before the Nyanya attack, Boko Haram had massacred over 200 people in remote villages in Borno state on 12 and 13 April. And on the same day of the Nyanya incident, the group also slaughtered more than 60 people in separate attacks at Kala Balge, near Nigeria’s border with Cameroon, and Bauchi state. Out of the more than 60 attacks that have been attributed to Boko Haram this year (as of mid-April), 10 of these have led to 100 or more deaths, and 11 led to 50 or more deaths. Since the group reinvigorated its campaign in 2009, more than 5 000 people have been killed. This year alone, Amnesty International has estimated that 1 500 people have died in Boko Haram-related attacks and government counter-attacks. The fourth factor – and perhaps the biggest problem in containing Boko Haram – is its reported links to Fulani herdsmen, who have been involved in an age-old conflict with farming communities in northern Nigeria. The alleged involvement of Boko Haram has changed the dynamics of the conflict. The herdsmen, who historically have been poorly armed, now flaunt sophisticated weapons. They have also expanded their grievances to include government-related issues, which has spurred more deadly attacks by herdsmen, making them the most lethal force after Boko Haram. Resolving the Boko Haram problem now means that the government must also address the lingering herdsmen-farmers conflict in northern Nigeria. The Nyanya attack seems to have been planned to coincide with the date 14/04/14: a unique date this year. It is also an attempt to sabotage the World Economic Forum that Nigeria will host next month to celebrate its new status as the biggest economy in Africa. The attack has been a serious blow to the National Conference that Jonathan launched in Abuja on 17 March to address obstacles to peace and security, development, and the country’s democracy. To effectively address the issue of Boko Haram, the Nigerian government must prioritise uniting the country and winning hearts and minds in the fight against the militant group. It must depoliticise terrorism and counter-terrorism by refraining from making baseless accusations, and any such accusations should be sanctioned by law. There is also need to create a balance between military and criminal justice responses that would see Boko Haram prosecuted through a special criminal tribunal.